Small and cute, elegant, stylish and natural handbag bag for all seasons ,plenty of room with zipper will ensure you never lose your cell phone, keys or wallet again! When your life is active, you need a chic shoulder bag with lots of pockets. It's Fashionable, affordable and convenient, you'll want one in every color. Fashionable, affordable and convenient, you'll want a Angel Barcelo handbag in every style! This chic design has plenty of organized storage, enough room for your cell phone, wallet and makeup with space for virtually any standard tablet. The two large compartments offer even more options for keeping all your essentials easily available. 1. Please allow us little color difference due to the different monitor and light brightness. ♔ Structure: three on the front, one zipper pocket on the back, external multi-pocket design, beautiful and practical can be used to place various small items, the main body of large interior compartments. Interior cell phone pocket, multifunctional slip and side zipper pocket. ♔ Features: Super practical & fashion design,a small cute bag suitable for use in various occasions, small size, large capacity, can be placed daily cosmetics, mobile phones, wallets and other daily items, daily travel, shopping, travel, easy to carry, but also as a gift to friends, loved ones. 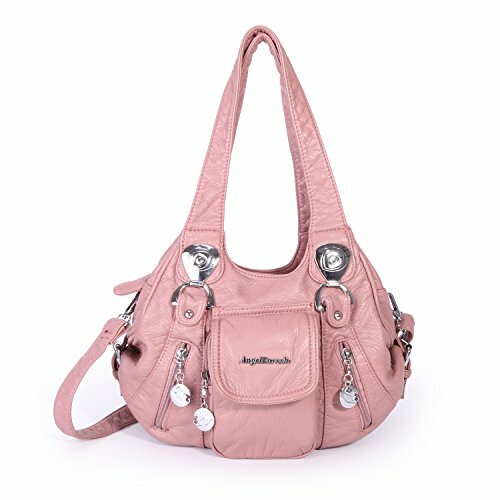 ♔ Dimensions:12.2*3.6*9.0 inch, double strap medium height: 8.6inch, weight 1.38 pounds ，with a removed and adjustable shoulder strap.